The collaboration between Obsidian Entertainment and Square Enix on Dungeon Siege III may end up producing something beyond expectations. When Square Enix acquired ownership of the Dungeon Siege franchise and handed it to Obsidian Entertainment for Dungeon Siege III, you might have jokingly thought the result would be something like Secret of Mana mixed with Alpha Protocol. As it turns out, that's exactly what the two companies are going for. In an interview with CVG, Obsidian lead designer Nathanial Chapman said that Dungeon Siege III is being designed to work in a similar way to the Dungeon Siege titles of the past, but with a touch of Square Enix and a dash of Obsidian. 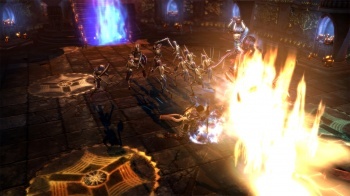 Both are bringing some of their signature elements to the game to create a new Dungeon Siege experience. Chapman revealed that Dungeon Siege III will have a "full branching dialogue system" just like those from Alpha Protocol or Mass Effect, which wasn't an aspect of previous Dungeon Siege titles. He didn't expand on what this means exactly for the game, but it hints toward a storyline where players can choose to be lawful good or chaotic evil. Square Enix is adding its touch to Dungeon Siege III by ensuring that Obsidian focuses more on story that it normally might. Chris Taylor of Gas Powered Games, serving in an advisory role on the title, says that Square Enix's primary influence is "taking the story and saying 'you're going to spend a lot more on the story than you typically would if you were left to your own devices.'" Square's "core agenda" is basically to make a bigger and better storyline for the game. Conversely, Chapman emphasized that story doesn't carry a game by itself, and Obsidian also realizes that core gameplay mechanics need to be strong to make something worth playing. The studio is taking inspiration from a mass of other successful action games and action-RPGs. Chapman says: "I looked at Dungeon Siege 1 on PC and thought how can I take that game, Secret of Mana and Legend of Zelda and make that work." Additionally, he says titles such as Devil May Cry, God of War, and Ninja Gaiden have inspired certain Dungeon Siege III mechanics. Whew. By the way, the game also has four-player drop-in-drop-out co-op on PC and console. It's all just talk right now, but Dungeon Siege III is apparently being set up as more than a hack-and-slash Diablo clone. We'll see if Obsidian and Square Enix can pull off their lofty goals for the title when it's released on the Xbox 360, PlayStation 3, and PC sometime in 2011.